Get a clear picture of your team’s whereabouts as they move from job to job throughout the day. In Jobber, GPS tracking and waypoints works by dropping a pin on the in-app map. 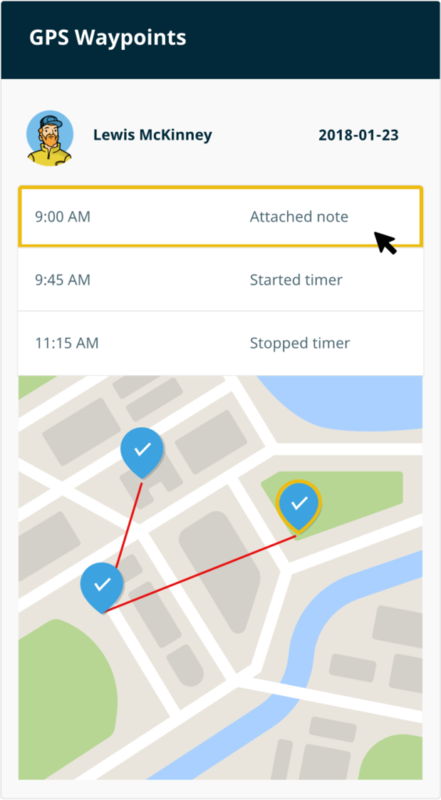 Every time someone on your team clocks in, edits a job, or creates an invoice, Jobber tracks their exact GPS location. View your team member’s locations on Jobber’s map and adjust the rest of the day’s jobs accordingly, or assign a nearby team to a new last minute job. You know where your team is and you have another avenue to confirm a job well done with a client in case of disputes.